We’ve shown in recent posts that UBS underwrote $1.7 billion of unmarketable ERS bonds and bought them into the UBS PR Funds. You can find our earlier blog posts here. UBS made room these ERS bonds by selling out of the Funds other bonds UBS didn’t underwrite. UBS bought the ERS bonds it underwrote in 2008 because there was no other market for the bonds it was underwriting. Recently we illustrated how UBS-underwritten conflicted bonds purchased by UBS into the funds in 2008 caused losses in the UBS funds at three to four times the rate as the rest of the Funds’ portfolio holdings. See our post What Hell Hath UBS PR Wrought. We’ve highlighted in the past a substantial change in the planned 2008 ERS Offerings. 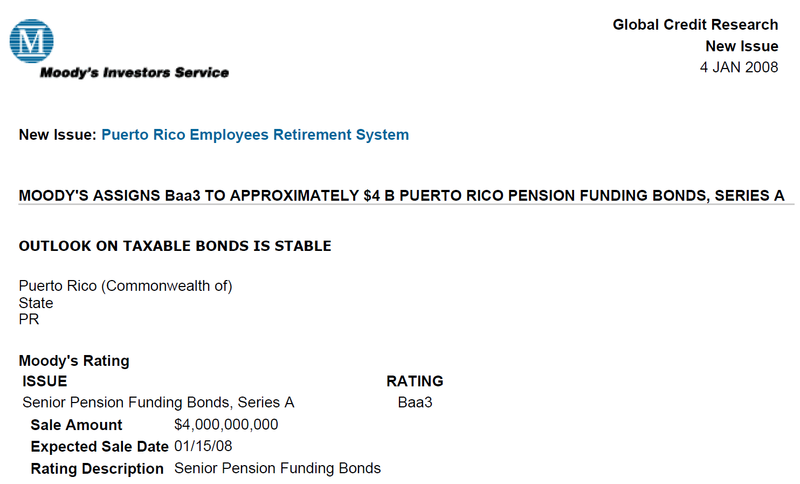 See UBS Succumbed to Conflicts and Purchased $1.7 Billion of Employee Retirement System Bonds into its Puerto Rican Municipal bond Funds in 2008. Our focus was on the evolution of UBS’s understanding that there was no non-Puerto Rican market for the Series B bonds and not even a Puerto Rican market for the ERS bonds on the terms they were being offered. The January 29, 2008 Series A Offering Circular said the Series B bonds would only be sold to non-Puerto Rican investors but by the time the May 28, 2008 Series B Offering Circular game out, the bonds were only going to be sold to Puerto Rican residents, effectively really only to be bought by the UBS Puerto Rican Funds. The January 29, 2008 ERS Series A Offering Circular is available here. The ERS May 28, 2008 Series B Offering Circular is available here. The ERS Series C Offering Circular is available here. A Conway MacKenzie, Inc., October 2010 report, Review of the Events and Decisions That Have Led to the Current Financial Crisis of the Employees Retirement System of the Government of Puerto Rico available here found that Merrill Lynch attempted unsuccessfully to sell $7 billion of ERS Pension Obligation Bonds in 2007 and was replaced by UBS as advisor and lead underwriter of the January 29, 2008 ERS Series A Offering. Sometime between 2007 and 2008 ERS and Merrill Lynch’s plan to issue $7 billion in Pension Obligation Bonds to investors off the island transformed into ERS and UBS’s plan to sell $2.94 billion of which $1.7 billion had to be bought by the UBS Funds. I just came across Moody’s January 4, 2008 Ratings Report available here and Standard & Poor’s January 14, 2008 Ratings Report here. It is clear that at least as late as January 14, 2008 ERS and UBS were intending to issue $4 billion of ERS POBs in the two weeks left in January 2008 and another $3 billion later in the year. Whatever happened in the fifteen days between January 14, 2008 and January 29, 2008 it was dramatic. ERS and UBS realized they could only sell $1 billion – not $4 billion – of the ERS bonds on the terms they were being offered in January 2008. $650 million of the $1.6 billion Series A bonds were bought by the UBS Funds so there was a market for at most $1 billion. It must have become clear no one else would buy the bonds and UBS was about to lose out on lucrative underwriting fees. The correspondence within UBS and between UBS and ERS in January 2008 would make for fascinating reading. Our interest isn’t idle curiosity. Investors in the UBS Funds lost $1 billion on the $1.7 billion of ERS bonds UBS stuffed into the Funds.